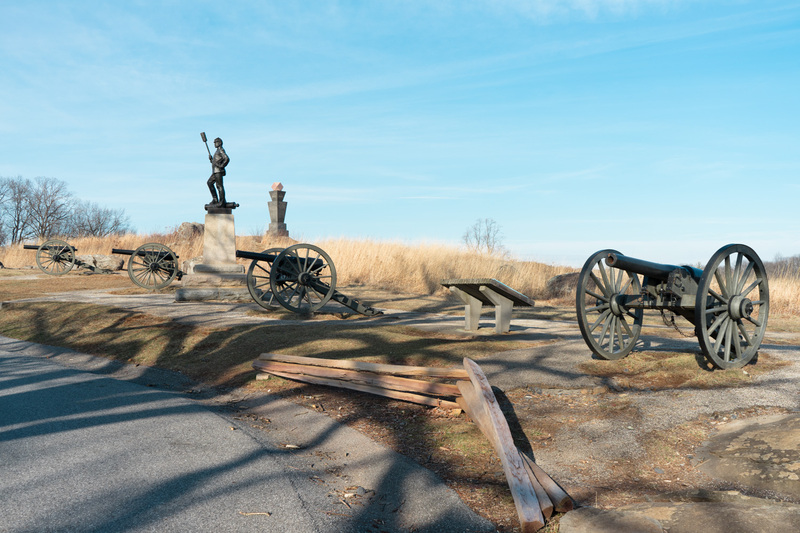 Every time I go to Gettysburg 2 things occur. I always seem to get a decent crop of photos and I always seem to leave the battlefield in a state of disarray. 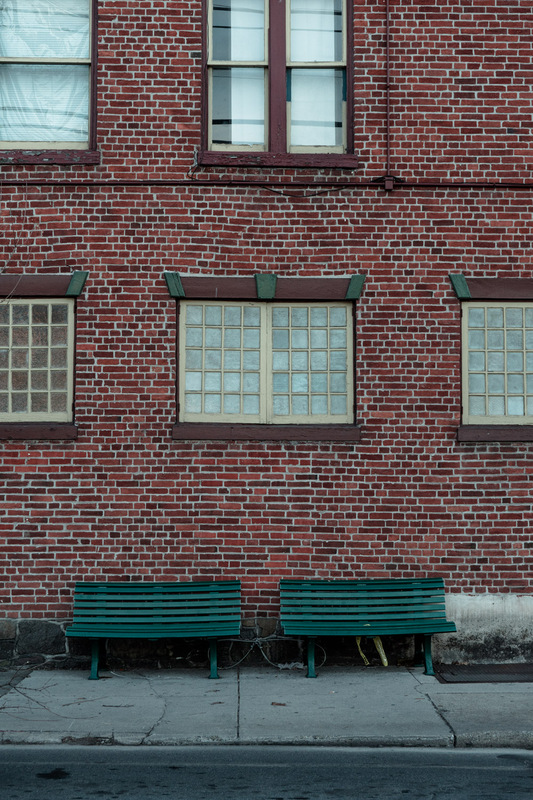 I attribute my photographic leanings to the wonderful vistas not readily found in Pennsylvania. 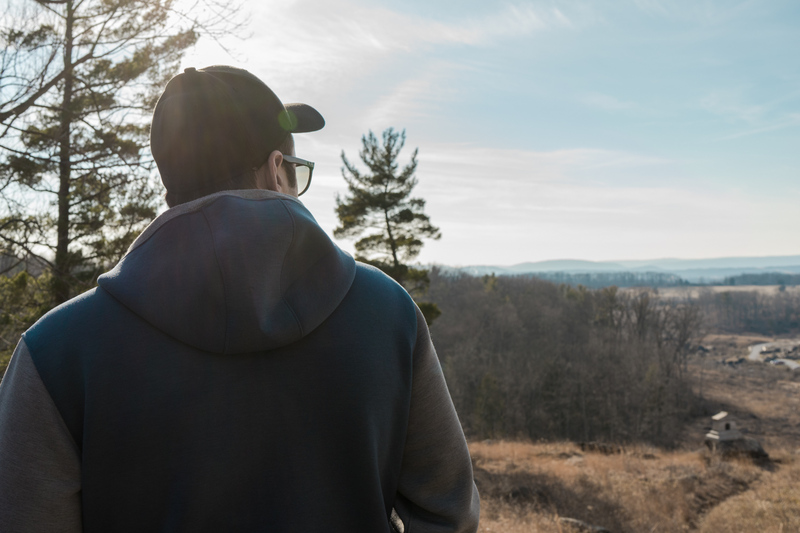 Most of Penn’s Woods is carpeted in thick forest with views rarely exceeding 50 yards. 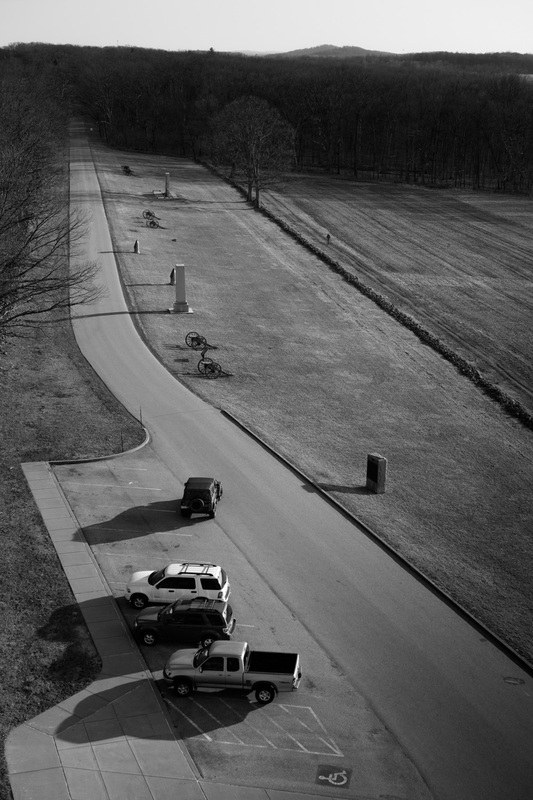 The space provided by the rolling hills and grasslands of the battlefields is presently beautiful and historically brutal. Which brings me to my second point, my state of disarray. It always throws me through a loop to see people enjoying themselves on the boulders of Devil’s Den, boulders once covered in cadavers & carnage are now the playgrounds for adults and children alike. I suppose it is a testament to the ability of time to heal, or perhaps it is darker. A statement of ignorance. I think it is probably a bit of both, with the ratio varying from individual to individual. But I can say for myself, when walking the battlefield, I feel a tremendous amount of reverence and respect. There is a quiet pressure that permeates everything. A scream of pain muffled by time. How else can you explain the desire and dedication to reenact the battles there? I understand the importance of living history, but to relive a day of such horror and pain seems absurd. Don’t get me wrong, I love living history. The older I get the more I appreciate the historic villages I was dragged to as a kid. Whether it was Old Sturbridge Village in Massachusetts, or Colonial Williamsburg in Virginia, I dreaded them as a child but now desire to head back and give them a second look. I rolled through the battlefields that day with my homeboy Sam. 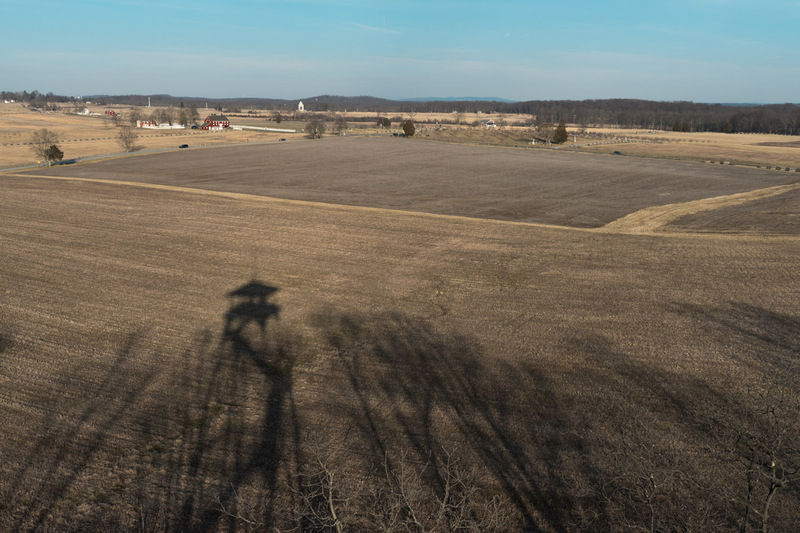 It was a random, unseasonably warm Thursday and Gettysburg is only a 45 minute drive south from Harrisburg on Interstate 15, my favorite highway in all of Pennsylvania. From Maryland to New York it is one of the chillest, most beautiful highways I have had the pleasure of driving on the east coast. 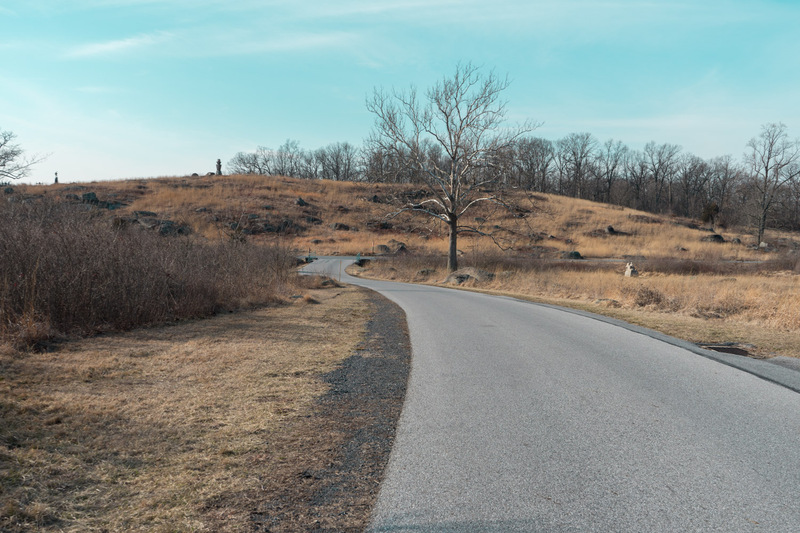 We entered into the park from the southern end via Taneytown Road. 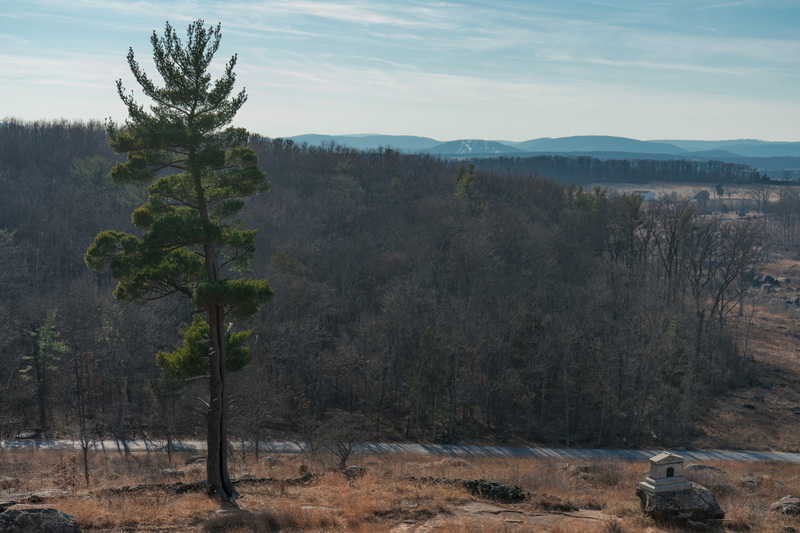 We parked on the backside of Little Round Top with the handful of other people there that day. 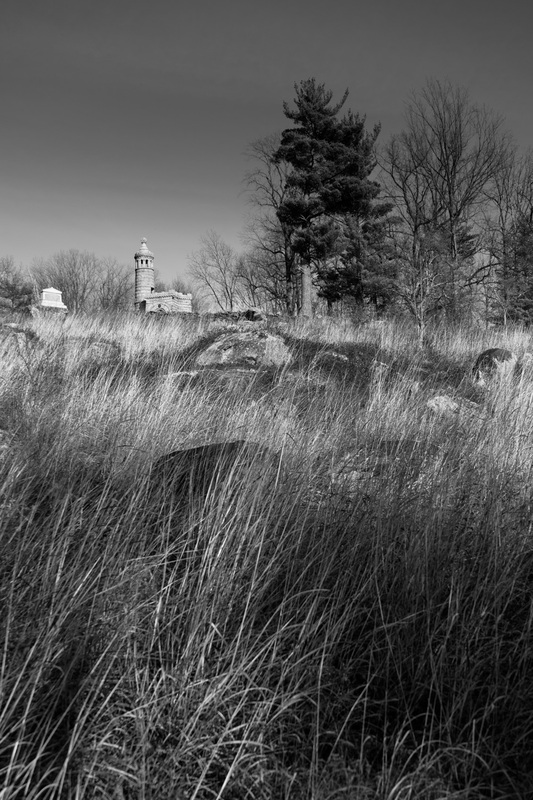 In prime season Gettysburg is a sight to behold. The town swells with tourists and the battlefields are flooded with reenactors and lined with spectators. 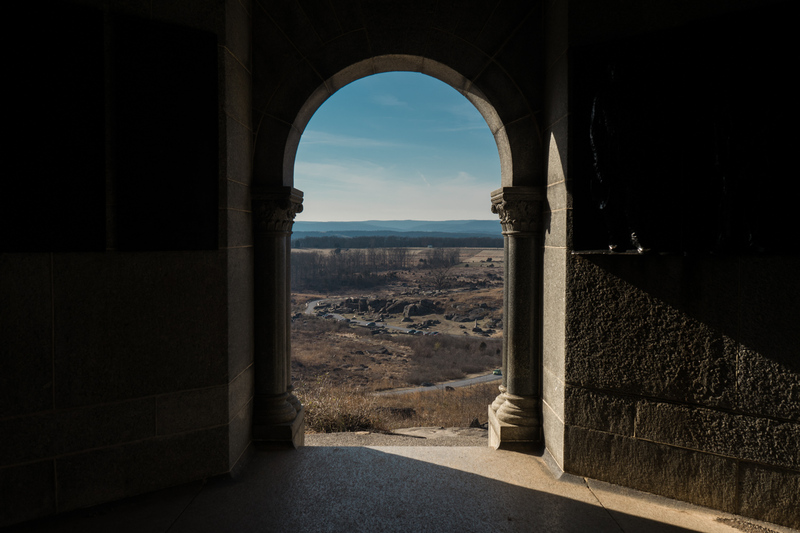 But back to Thursday, Sam had never been to the Gettysburg before so I figured a view from Little Round Top would be a nice introduction. 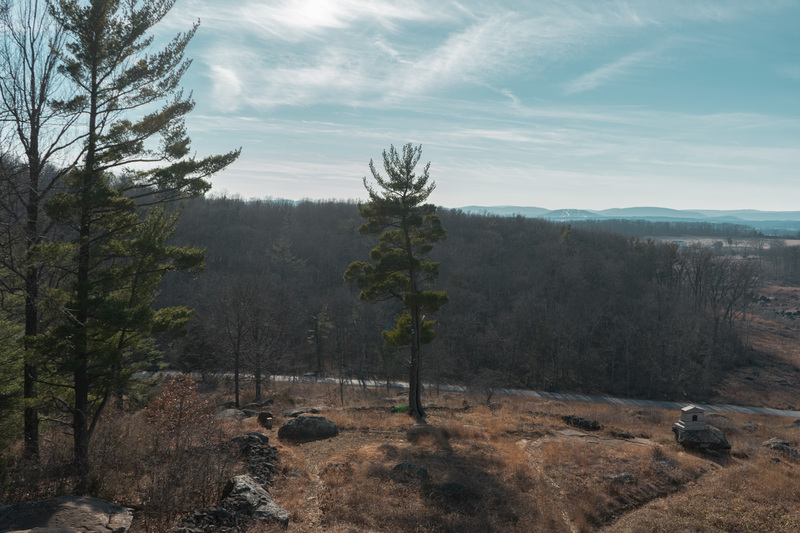 We walked along the ridge of the Little Round Top to the monument, or memorial, or watchtower, or something, that sits at the southern end. It is constructed entirely of rock, or stone, I’m not sure the proper terminology, and features a spiral staircase that leads you to the roof. Once on the roof you are greeted with an incredible panorama, which in hindsight, I should have shot a panorama there. 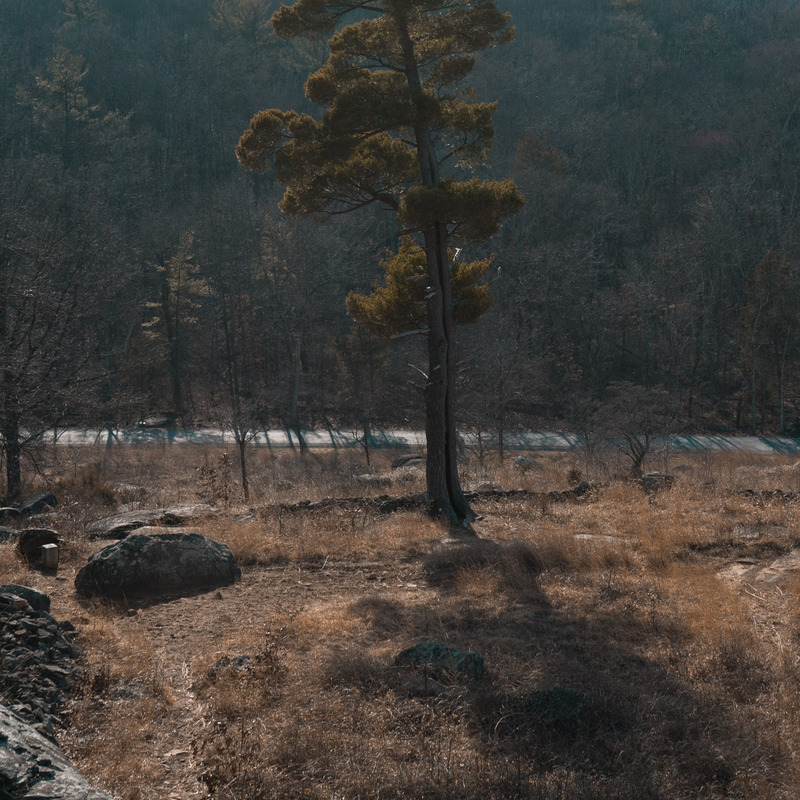 But my eye was drawn to a pine tree standing just south of the structure. The way the tree caught the sun on the tips of its needles, separating it from the forest behind it, was something I felt deserved attention. 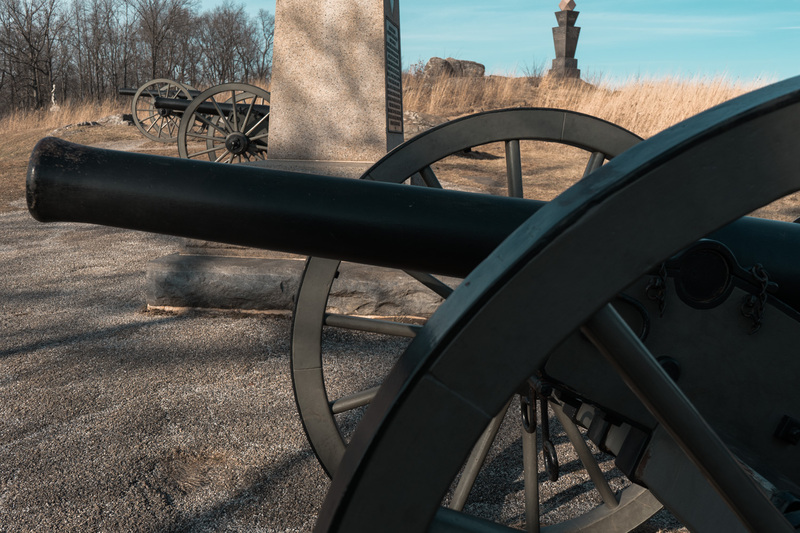 If you’ve ever been to the Gettysburg National Military Park, you know it is dotted with statues and structures memorializing certain companies, states, and places of the battle. 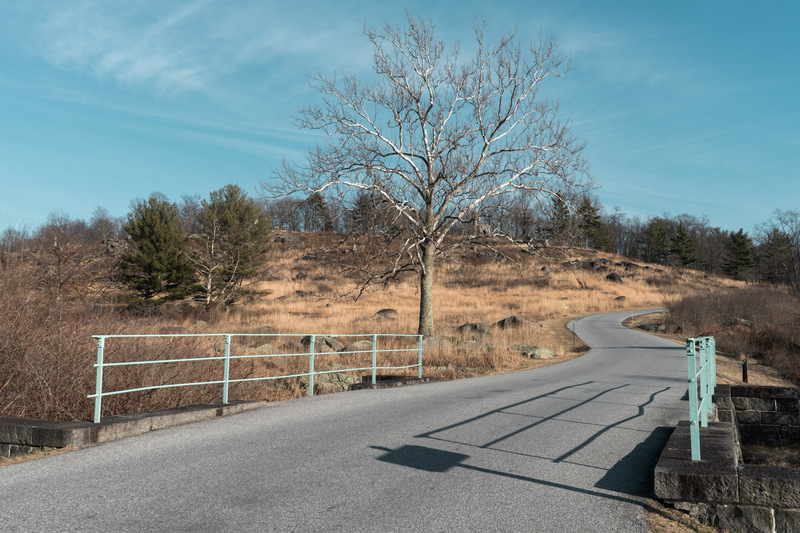 Most of them are easily accessible via the network of roads that snake through the park. Most visitors to the park choose to drive from one parking lot to the other, but Sam & I decided to walk more than drive. 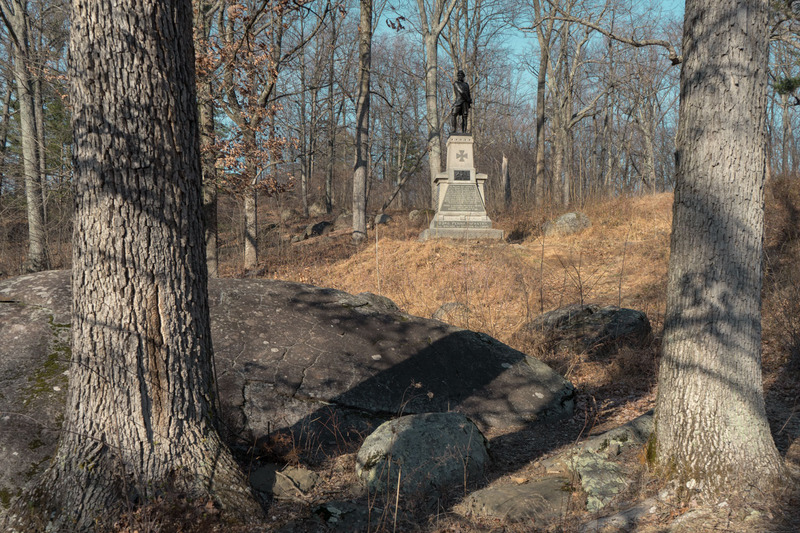 From the top of Little Round Top to Devils Den is less than a 10 minute walk, and yet Sam and I were the only ones walking. 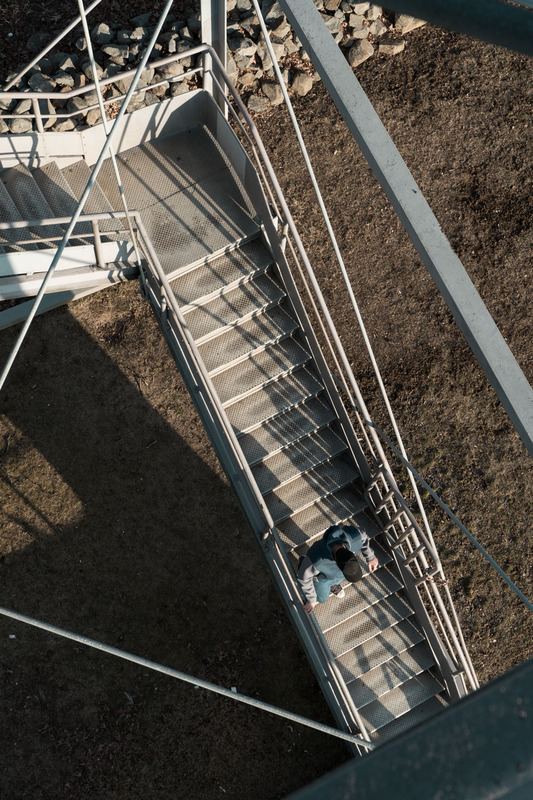 After walking around Devils Den we hopped back in the truck and headed to the Longstreet Observation Tower, which borders the Eisenhower National Historic Site. 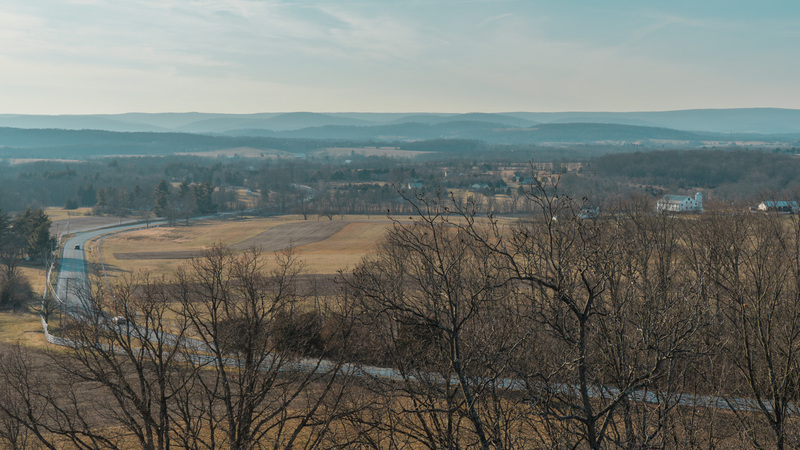 From the top of the tower you can see the famed Peach Orchard, Little Round Top and the town of Gettysburg sitting in the distance. I didn’t make any photographs of the town, as I have some in the archive, but in hindsight I should have definitely taken a few. 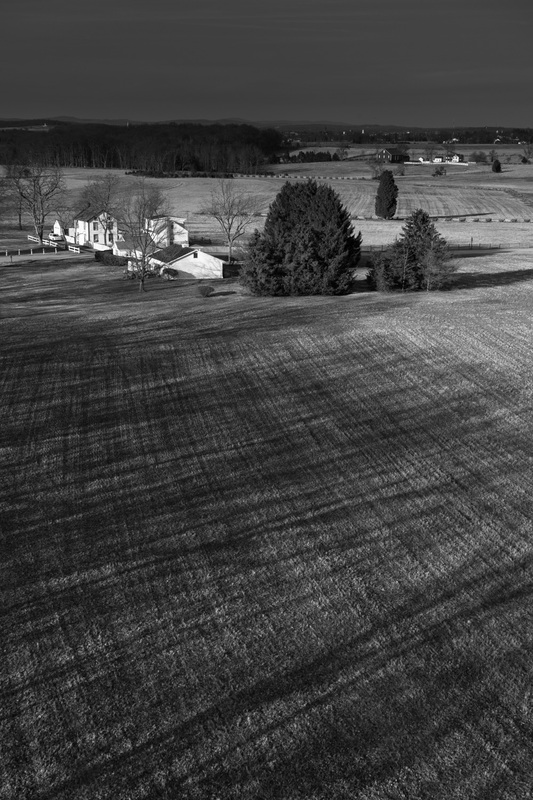 The town sits between the surrounding mountains and the farmer’s fields that define much of Pennsylvania’s landscape. 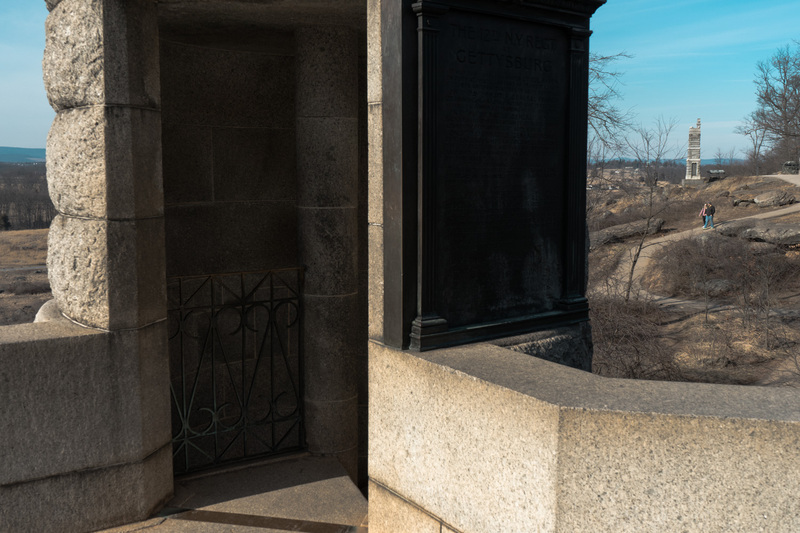 As mentioned earlier, behind the Longstreet Tower sits the Eisenhower National Historic Site, the property that would serve as Dwight D. Eisenhower’s weekend retreat and meeting place for foreign dignitaries. We didn’t go, as the only way you’re permitted to do so is via a shuttle from the Visitors Center. Maybe one day I’ll go there, but I doubt it. After taking in the view for a spell, we decided to walk back down to the truck and keep it moving. 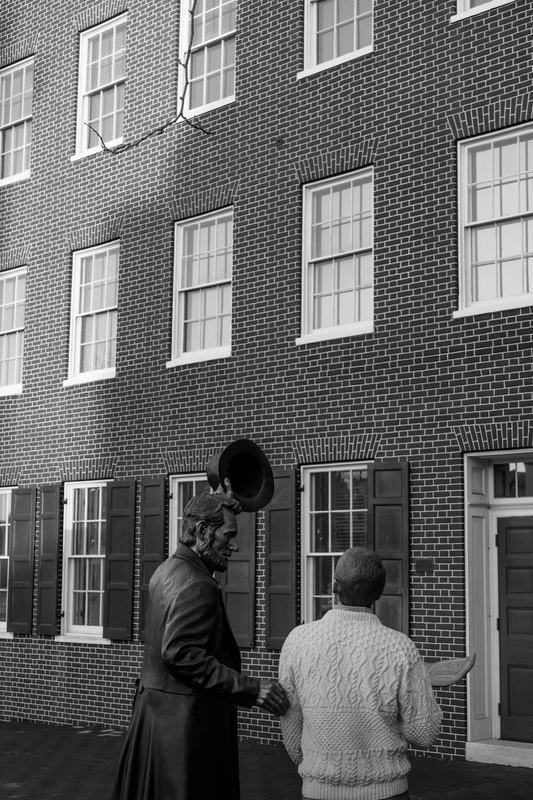 We rolled slowly down the one way streets and past more monuments before we ended up in town. 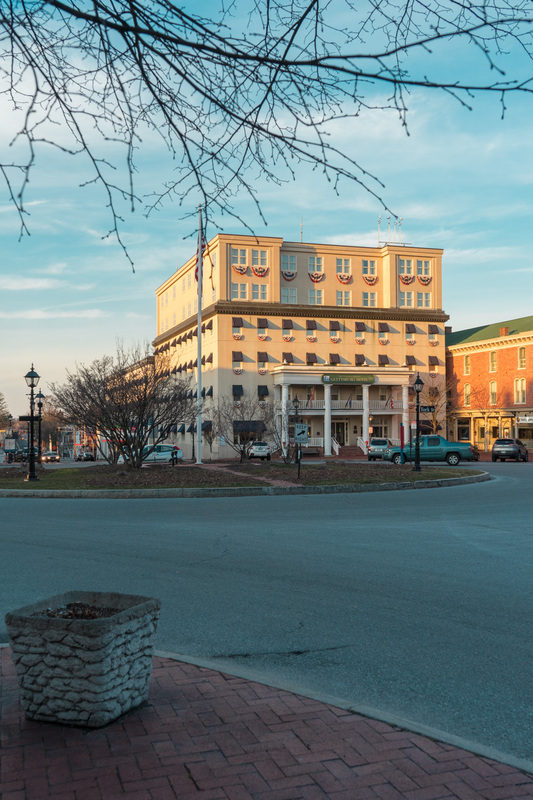 Home to Gettysburg College, the town is well kept in most areas and features a quaint downtown that circles the Square. Well it’s actually a roundabout, but we’ll call it a square because they, the Gettysburgians, do. After driving every road that led into and out of the square, we decided it was time to park and find a spot for a bite to eat. After walking in a couple different pubs and taverns that were filled to the brim, we decided to pull up our trusty cellular devices and see which pub was worthy of our palettes. But more importantly, which ones weren’t absolutely swamped with diners. We decided on a little hole-in-the-wall diner that sits right on Chambersburg Street, Ernie’s Texas Lunch. Neither Sam nor I are foodies, we both like simple fare, and the small, vintage interior coupled with the simple menu was just what we were looking for. I got the bacon cheeseburger and fries and Sam got the hot dog meal, 2 dogs, a drink and some fries. The food was what we expected, authentic diner quality; tasty and affordably priced. 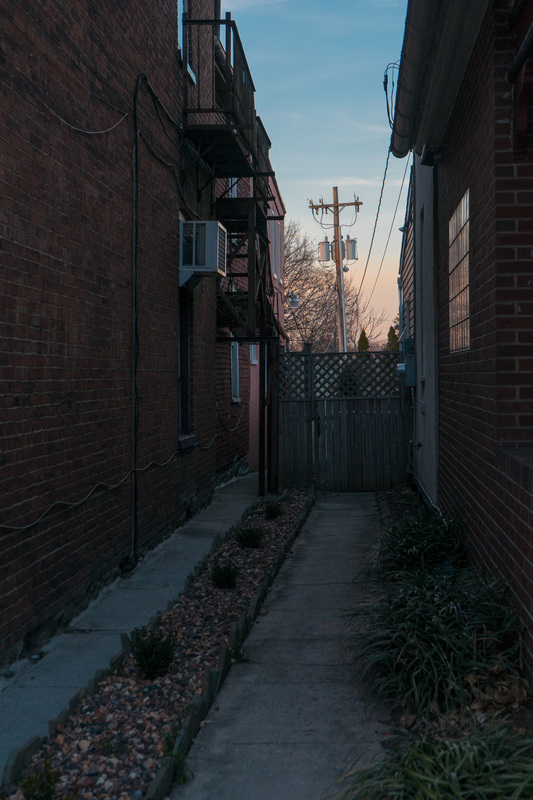 After dinner we walked out onto the dark streets and decided it was time to head back to Harrisburg. I have a feeling I’ll be back in Gettysburg shooting some night photography once the tourist season kicks into full swing. I can only imagine the shots I’ll get in that quaint little town full of reenactors.